I wanted to write a bit more about creative routines, which is quite fascinating, but I guess I will have to leave it to a later blog post when I have time to really sit and write. Can never really quite get tired of lilac hydrangeas! It's been a while since I attempted to make some dollhouse miniature desserts, and believe it or not, I've not tried making the swan desserts yet! I saw some very elegant ones on Pinterest the other day and that prompted me to make some. I've always loved the white, elegant, pristine look of the swan. Thus, I naturally wanted to keep that look while making these. White chocolate mousse is the main theme in this dessert. I'm so excited to share with you my experimentation of making dollhouse miniature transparent cups using UV Resin and some molds. Before these materials were readily available, it was quite hard to make them properly, especially if you wanted your cups or glasses to look the same equally. Then came the transparent air dry clay, which was pretty much the best answer to creating realistic looking transparent cups. The downside of it was that you had to be patient to let it dry. So if you want to make more than a few, you probably need a few days or even a week or two. With UV Resin, everything is so much easier and faster. Below, I will write out the simple steps that you can follow to make your own! It's really simple to use the UV resin with the push mold here. Simply squeeze the UV resin into the mold. It is best to fill up to 3/4 full. A way to check is to cover the top of the push mold and see if the resin comes right up to the lid of the push mold. It is OK to have some UV Resin touching the top of the push mold. In fact, I prefer that so that your cups will be of the same equal height. Keep the lid on and put it under the UV lamp for a few minutes. After a few minutes, remove the top lid and remove cup from the mold. Use penknife to gently cut excess resin that has over-spilled. Lastly, use sandpaper to gently buff the edges to give it a smooth round finish! Here, I have the 2 different size cups made with UV Resin. 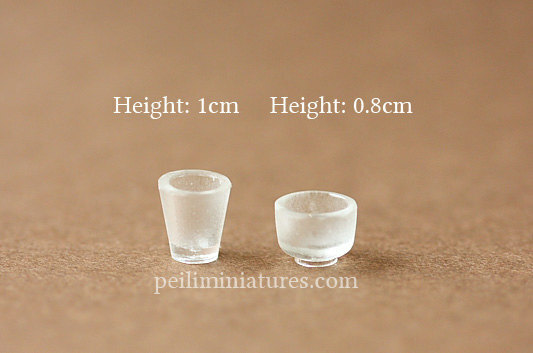 Both are suitable for 1/12 dollhouse miniature scale. Cup molds are available here and here. UV Resin is available here. Lastly, the same method can be used for making plates, bowls as well! Have fun! Hi everyone! I've been busy quietly working here as usual. I wanted to present another new dollhouse miniature lace cake stand which I made just recently. I find it hard finding the right parts to assemble and make dollhouse miniature cake stands here, so when I chance upon something, I'm quite excited. Also, you know that there are certain styles or look that appeals to me more than others, so I trust my instincts when it comes to things like this. The new design is on the left - 1.6cm. Very simple but elegant. I also like the height difference from my previous lace cake design. You see, I think when it comes to styling, it would add a beautiful dimensional look to your miniature scenes when you can find different dollhouse miniature lace cake stands to display your pastries. So, I am quite excited myself when I created the new one. It is available here. The older version, at the approximate height of 1.9cm is available here.